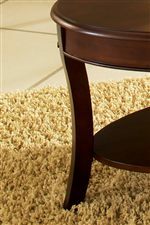 Accentuate the side of your loveseat, sofa, or chair with this elegant and refined round end table. Supported by four sabered legs and a lower bottom shelf, this table provides you with just enough room to display home accessories or a reading lamp without taking up too much room. With its polished look and rich brown finish, this table is sure to add a traditional and contemporary appeal to your home. The Troy Round End Table with Sabered Legs by Steve Silver at Walker's Furniture in the Spokane, Kennewick, Tri-Cities, Wenatchee, Coeur D’Alene, Yakima, Walla Walla, Umatilla, Moses Lake area. Product availability may vary. Contact us for the most current availability on this product. The Troy collection is a great option if you are looking for Transitional furniture in the Spokane, Kennewick, Tri-Cities, Wenatchee, Coeur D’Alene, Yakima, Walla Walla, Umatilla, Moses Lake area. Browse other items in the Troy collection from Walker's Furniture in the Spokane, Kennewick, Tri-Cities, Wenatchee, Coeur D’Alene, Yakima, Walla Walla, Umatilla, Moses Lake area.